I began recorder by doing a black belt program for which the students progress through 24 songs to get 9 different belts. My first year, five students achieved a black belt and only because they came in extra times before school. In the school year (2011-2012), I changed how I prepared and taught the recorder and it was a huge success. Every student in the fifth grade got a black belt and many earned up to 25 extra belts. This past year (2012-2013), I continued how we did it but pushed the kids more and let them suggest new belts and again, every student earned a black belt and we now have extra 57 belts. At least 8 students filled up their whole extra belt chart and about 4 students earned every single belt. 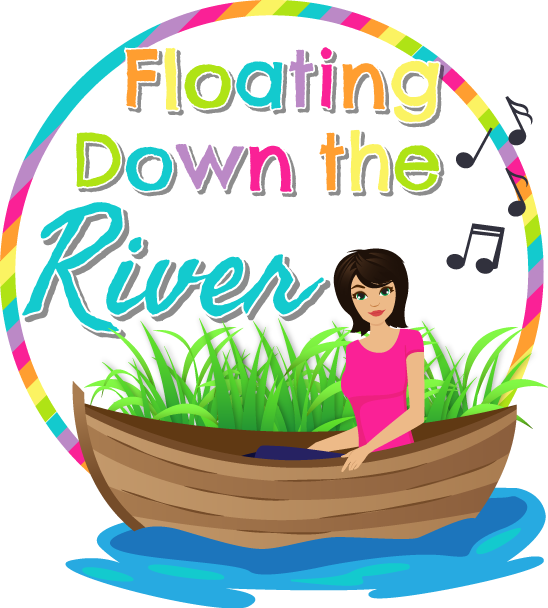 I will write several more posts about my recorder prep and procedures in the near future. 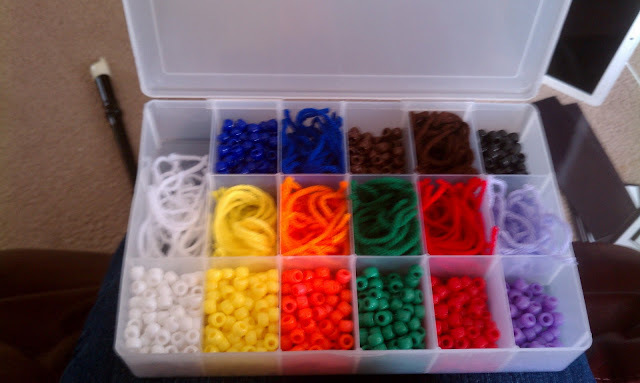 When I started recorders, I just used a plastic embroidery floss box I bought at Walmart for a few dollars. They also sell them on amazon.com for a little more. I put my regular belt music into a plastic crate with file folders. The kids would get music as needed and put it away when done. I also have a music crate for my extra belt music. I told the students who have their own recorder that they could take music home if they were going to practice. Here is a picture of the regular belt music crate. I would just put it on a counter. I put my extra belt pictures and yarn into a similar crate this year and it worked okay, but as the students became tutors and began passing off more and more belts, it was not efficient enough. Here is the crate with the extra belts in alphabetical order. 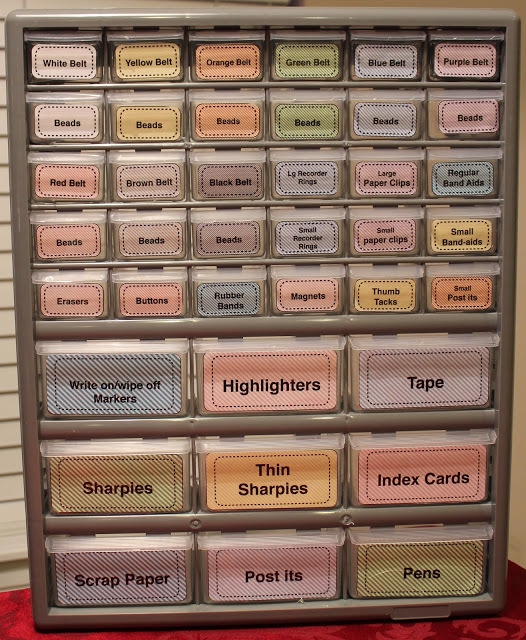 Get your free labels here. After making my teacher Teacher toolbox that has my 9 regular belt materials plus various teacher supplied that I need, I decided to make one with all smaller drawers for the extra belts the students earn. My regular belt teacher toolbox (click on Teacher Toolbox above to read more about it). Each drawer for my extra belts (below) has my recorder icons (picture they put on their chart) and the yarn to go with the belt. I got a drawer with boxes all the same size on amazon.com. I justified the cost because I use it for half of the year, and it will make things go much more smoothly. See the 64 drawer cabinet from amazon.com. 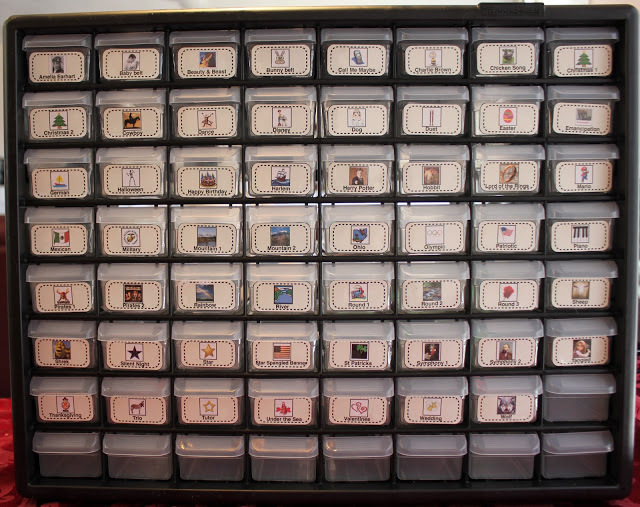 I took my icons that I use for the students to put on their Black belt recorder charts and made labels for the drawers. It is going to work well. I even have room for some of the new belts we will come up with! 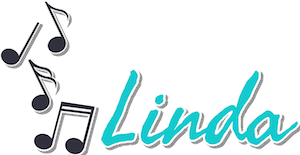 Check out my huge Recorder Mega Pack with tons of resources HERE. 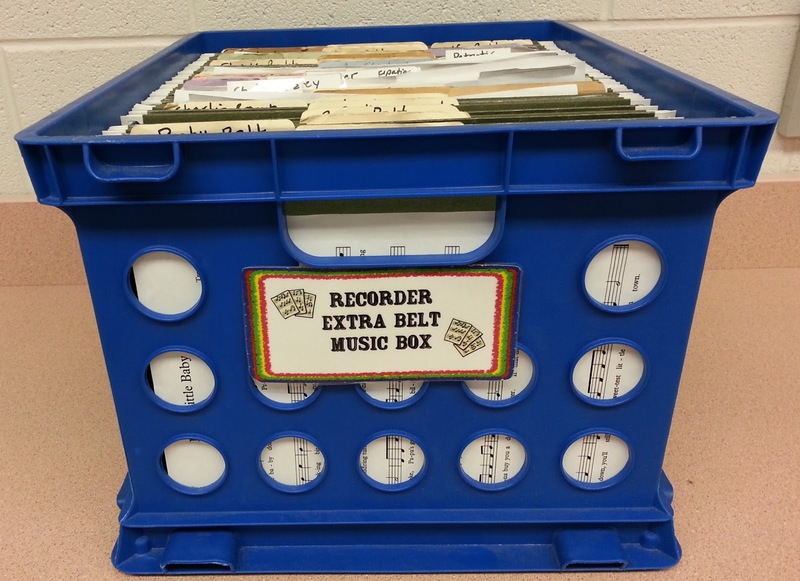 Love all your ideas for organizing recorders! Thank you! I did it to keep my sanity! It makes playing recorders so much easier!